We have developed a menu of strategic solutions to meet the challenges your institution is facing. Our execution and operations are scalable so at any level you can benefit from our experience. We customize our service solutions to support a few staff members, a division, or at the program level. We have designed a expert professional network capable of addressing the most complex or routine issues in capital and facility management. The challenges we can assist you with can be focused in one area or several immediate priorities. We supplement the owner, we assist you with data, resources, and conclusions so you can make informed decisions, we don't replace your project teams or program/construction managers. Your teams can become more efficient, more efffective, and more valuable. Your projects become more successful as your team improves communication, manage costs, and increase controls. Training/coaching existing staff to support more technical administrative processes including controls, construction, facilities, and project management. ​Systems and tools are essentials in effective project management. Monitoring, reporting, and controlling Key Performance Indicators (KPI's) for building, capital, and maintenance programs require rigid and regular oversight. Todays challenges require automation, standardization and organization. 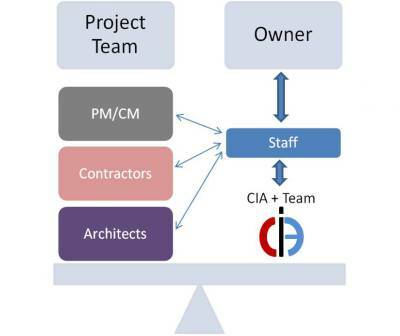 The CIA team will collaborate with your staff to enhence, streamline and optimize your system. Combining various programs and systems tools requires integration with your current process, staffing, and current needs. Facility programs vary through their life, scaleable tools and systems which can incorporate accommodate growth, reductions, independance, and economy. Procedural boilerplates for facilities policies, standard specifications, drafting facility resolutions or complex agenda items, and draft staff reports, etc. ​​Project entitlements and the construction technology has imploded making capital and facility programs more complex than ever before. Having specialised technical support at your finger tips is essential component in todays environment. The CIA team will get you the right information from the right professionals at the right time. The complexity for assembling the technical support has exponentially grown as well, creating a need to strategically implement and develop the scope precisely. CI Academy resources include online access to training and continued educational topics in project management, highlighting design, facility, and construction. CI Academy workshops, seminares, and course on current and relevant trade support on specific challenges and topics; keeping your team informed on the many trades solutions from the vendors, manufactures, suppliers, and professionals. ​CI Academy becomes your institution's Academy, designed to support your teams in coaching, technical advancement, and support.